Intertwined Bubbles, originally uploaded by Silversmyth. The intertwined bubbles design was created yesterday to be symbolic of marriage. I was thinking about design in its relationship to writing prose or poetry. The goal when writing is to say the most you can with the fewest words. Writing should be clean and uncluttered. My husband and I discuss design often. He tells me that poetry is kind of like design in that it’s best when simple, not over-reaching for depth or meaning. It has to happen and not be forced, or at least it has to appear that way. Here is a poem my husband wrote just before we married in 1998 which I believe to be an excellent example. from the sun’s blinking eyes. to the ends of your hair. So much of the jewelry design I see when shopping online or in stores is cluttered with stones and beads. But my favorite designs to see and wear are simple and classic. His advice on writing and design put into words what I believe about design. My designs should be simple and elegant. Uncluttered and clean. They should make the person wearing them feel confident in wearing a classic look that will not go out of style. What I like about this circle design that it is versitile enough to compliment any outfit from jeans to an evening dress. On leather (as shown) this pendant is a great everyday wear item. 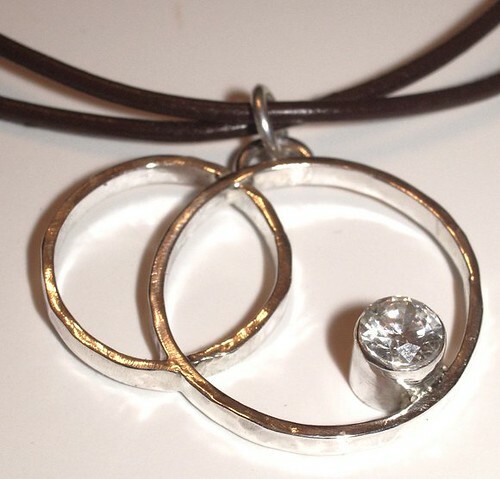 If you plan to wear it with evening wear I suggest selecting a sterling silver chain in 16, 18, or 20″. The pendant should fall just below the collar bone. On a small person, that’s a 16″ but on most people an 18 or 20″ is better. Pendant with brown/black cord or varius lengths of sterling silver chain. Your choice of White (Super Premium) Cubic Zirconia, Simulated Aquamarine, Lab-grown Ruby, Natural Yellow Citrine. (See photo of stone colors reminiscent of Andy Warhol’s lithographs and Paypal button below.) $84.